A new international campaign hopes to save a group of people who have been dubbed "the most threatened tribe in the world" — the Awá tribe of Brazil — from encroaching outsiders who are gobbling up their land. The Awá live in the Brazilian state of Maranhão on lands set aside for their hunter-gatherer lifestyle. But according to the tribal advocacy group Survival International, which is leading the new campaign, the tribe is increasingly under threat by illegal settlement and logging on their lands. 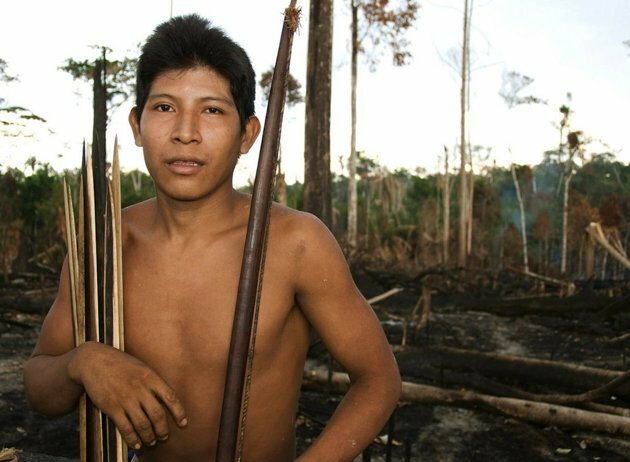 One reserve set aside for the tribe, the Awá Territory, is one-third deforested, its trees stripped by illegal logging operations, some with sawmills operating only miles from Awá land. The issue of indigenous people's land rights is an international one. Survival International estimates more than 150 million tribal people currently live in 60 countries worldwide. The most voiceless of these are uncontacted tribes, people who live without interaction with the outside world. 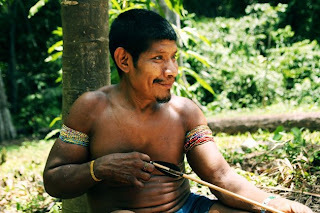 Survival estimates that there are about 100 uncontacted Awá in addition to the 360 or so who have semi-settled in villages on their legally protected land. After first contact with the Awá in 1973, the Brazilian government has opened up the region where the tribe has long roamed. After iron ore was discovered in the area, the European Community and the World Bank even helped fund a railway and other developments in the region. "This acts like a magnet for settlers to pour in, and ranchers, so Awá land started to be invaded," Watson said. The Awá's right to their land was formally recognized in 2005, making mining and other activities by outsiders illegal; but satellite photos of the forest reveal that these rights are not being honored. Illegal logging has left the scar of deforestation on the land. This is especially devastating to the Awá, who depend on the forest for their survival, Watson said. "When you talk to the Awá, it's just so clear how much the forest means to them," she said. "They just get everything from it." As the forest vanishes, the Awá are trapped in a legal battle to save it. In 2009, a federal judge ruled that illegal settlers had to leave the Awá territories within 180 days. A legal appeal by one of the largest cattle ranchers in the region delayed the ruling. In December 2011, a second federal judge ruled that colonists and ranchers had to leave the land by December 2012. Survival fears that continued legal wrangling will delay these departures, too. If the case continues in the legal system, it could take 20 or 30 years for the Brazilian Supreme Court to decide it. By that time, it will be too late for the Awá. "Time is not on their side," Watson said. In addition, reports from Awá tribe members and from the Brazilian Indian affairs office FUNAI suggest that this land controversy can all-too-easily turn deadly. In 1988, for example, townspeople in west Bahia, Brazil, met a lone native man who turned out to be of the Awá tribe. The man, Karapiru, had been living alone in the forest since 1975, when ranchers killed his daughter and wounded him and his son. The ranchers had taken his son, leaving Karapiru to believe him dead. "It's a violent part of the Amazon," Watson said. "You have bows and arrows against guns." Other tribes have also been haunted by violent clashes. In August 2011, FUNAI officials were alarmed to find evidence of a fight between drug traffickers and uncontacted native people, who went missing after the violence. Watson and her colleagues are hoping that their new campaign will put pressure on Brazil to honor the Awá's legal right to their land and provide the funding needed to enforce the protected areas' borders. "It's a very simple, direct message to the Minister of Justice," Watson said. "The land belongs to the Awá." Editor's note: This article has been updated to correct the funding source of the Carajás development program. The European Community contributed funding.